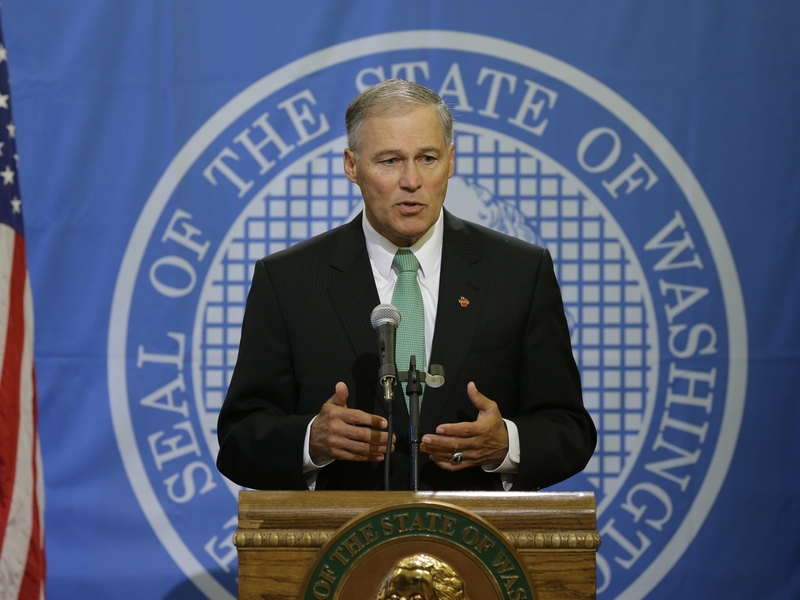 Washington State Governor Says He Welcomes Syrian Refugees : The Two-Way Jay Inslee is declining to join the many governors who say they don't want Syrian refugees within their borders. Jay Inslee says he won't join the growing list of governors who say they don't want Syrian refugees within their state borders. In an interview with NPR's Morning Edition, the governor of Washington state publicly welcomed refugees, citing the inscription on the Statue of Liberty, warning fellow governors against "fear," and insisting that background checks minimize whatever risk the refugees may pose. No fewer than 31 governors have taken steps to prevent refugees from being resettled in their states. All but one are Republican, and some — such as Ohio's John Kasich and New Jersey's Chris Christie — are presidential candidates. The one Democrat on the list, Maggie Hassan of New Hampshire, is currently seeking a U.S. Senate seat. The governors were responding to last week's attacks in Paris. One attacker, killed in a suicide bombing, was identified through a fingerprint as a migrant to Europe from Syria. Other attackers were residents of France or Belgium. But legal experts say the governors have little or no power to enforce a ban on such refugees. Decisions on refugee status belong to the federal government, and once people are admitted to the United States, there is no method to bar people of a certain nationality from any state. The governors' concerns nevertheless have a political impact. And Inslee is among a handful of governors, from both parties, who have gone out of their way to say refugees will be accepted. Utah Republican Gov. Gary Herbert declared his state "will do all we can to ease their suffering without compromising public safety." Of millions of Syrian refugees, fewer than 2,000 have so far been allowed into the United States. President Obama's administration currently plans to allow about 10,000 more.